Wedding Photographer for Charleston Harbor Resort & Marina. As a Wedding Photographer for Charleston Harbor Resort & Marina I had the honor of photographing this father walking his daughter down the aisle in this case the dock for her daughter wedding. A custom tradition going back a long time ago, and a very important time for the both of them, there are so many ways to capture a moment like this and I have always strived to create a new artistic image that incorporate the venue, for every wedding I capture after all they are all different and that is why every clients decides on with venue will represent them well. As in this wedding that I had the honor of capturing at the Charleston Harbor Resort & Marina, this fantastic venue is more like having you're wedding in the Bahamas, the resort has a beautiful red roof, a marina, a private large dock, a man made beach, a gorgeous view of Charleston, the Ravenel bridge and the Yorktown, and even a tiki hut, you really feel all of the elements of paradise. I have photographed many weddings there with the wonderful Ellen Harrington the wedding specialist for that venue, and for this event the bride kept telling me on how she loved the dock so much. 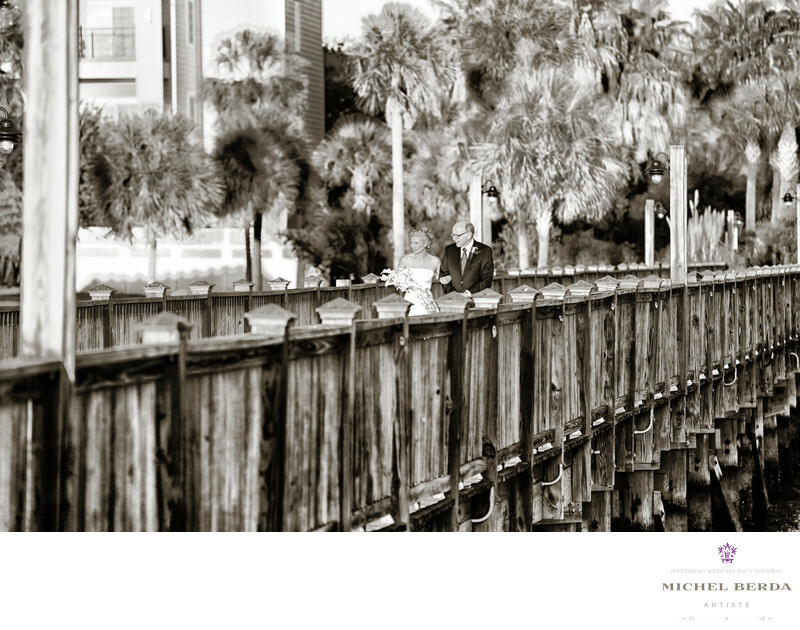 When this important moment came, I was very careful to make very sure, that I gave her an image like no other, I stood all the way to my right hand side, not in front of them, and I was able to have the drama of this image layout perfectly by capturing the beautiful rustic dock, palm trees, while letting the bride and her father have their private moment together, the toning of this image ads so much more depth to it that this photograph stands out like no other, more importantly the bride and her father will cherish this moment for a very long time at this wedding that was held at Charleston Harbor Resort & Marina.Keywords: Charleston Harbor & Marina Ravenel Bridge Yorktown (3).